Appended are the names of students who received scholarships. The Saraswati Vidya Kendra and the Shanbhag High School are managed by the Konkan Education Trust, Kumta, India. 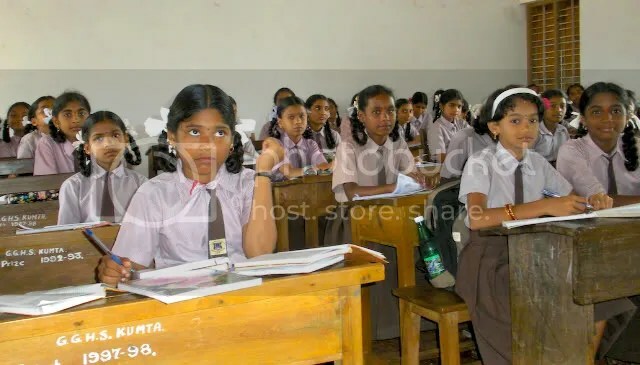 The Gibb Girls High School, Mahatma Gandhi High Shool, and the Gibb English Medium High School are managed by the Kanara Education Society, Kumta. 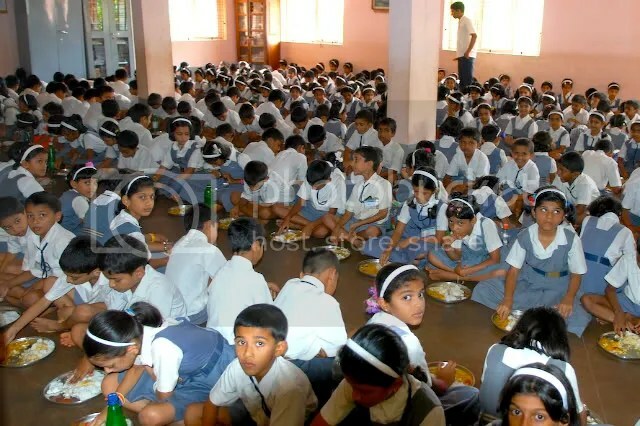 Since these Society Schools receive government aid, as well as food for their students, scholarships for students at these schools did not receive funds for midday meals. There is no examination, but scholarships are only for ‘very needy’ students in the kumta township of Karnataka State. When I saw these pictures of the Indian students, I want to visit the school in India! There’s always a lot to learn about running a school and issuing scholarship for the kids. You have achieved great work on that, Arun! Thank you Maple for your enthusiasm! Yes, you should come and visit the Schools and the area. A beautiful part of India! It was not me alone, but many of my family and friends who pitched in the funds to help out. I hope we get the opportunity to continue this work. Good luck in the excellent work that you are doing. Sent you an email with my cell number! Looking forward to knowing more about your project! What amazing pictures you’ve taken of the November attacks of Mumbai. I stay very close to the Strand Cinema and I took some px too, but nowhere as superlative as yours. I wonder if I may ask you to permit me to use one or two of your pics for my book which I am writing on the subject? Of course, I will credit you with being the photographer. Additionally, perhaps I can request you to write a small piece on this, a first person type of thing, which I would like to include in the book. Do write back to me, this will be my fourth book in print( not including a small compilation of spiritual articles which I printed a couple of years ago). Do let me know if I need to compensate you for using your pix. If you are still in Mumbai, may we meet at the Radio Club and talk about this? Thanks a million, Arun, God bless. That’s a wonderful thing that you are doing. Sorry to have come here after long time was down with viral flu and then there were other health issues that tied me up for 2 long weeks. I have always felt fortunate that my parents could provide me with right education and it has always been my dream to sponsor education to girl child. At present we are just working towards the same goal. I wish many come up like you who work to give back what they received from the society. Your post is just a reminder that humanity still exists. Good luck to you. BTW the link how to help did not work for me. A lot of sites are blocked here.. we have limited access here. would love to know more about this. Hi Ujwal – Sorry to hear of your illness; Hope you are feeling better and rested. Wishing you the best in this. As you mentioned, we take good education for granted; but when I travel to rural india I see so much silent poverty; folks make do with what they have. They live with dignity! Seeing all this i am moved to do more for them. This is one small way! I hope that with time we can give many such scholarships. I will copy the info and send it to you in an email! Rest and hope you are feeling better. Thank you SunshineMom for sharing the beautiful things you are doing! I think reading out the stories would be a fantastic experience for the kids! I wish you the very best in all that you do! And you are absolutely right! There is so much more that we can do for society. I am collecting good childrens’ books for a vision of mine – hope to give it some shape in the next few years! My dream is a library for slum children and I hope to read out stories and involve local people and supply free books. Presently we are only remotely involved by giving things like clothes, beddings etc. but I too hope to give back society for everything the humanity chain has given me! Reading your post made me feel so warm within – keep up the good work! More importantly, this is so satisfying work and I just love it! The kids are amazing! This is such a noble work! And u keep me wondering that r u in India or Boston…? Ha hA! Sonu! Recently I have been traveling between Boston and Mumbai a lot! see, I have a new boss in Mumbai! See this post! Well, 2 of your scholarship recipients, secured more than 90 % in the SSC exams!….wow…what a great news Arun…I really feel happy 🙂 At least, I (am) fully aware and understand the importance of potential education. You and ur family have been trying to give something good, back to our society …correct…? Yes! Lemme tell ya! The two kids getting more than 90% was the most awesome thing that we heard! But it was also sad, coz what happens to the kids when they reach college? We don’t have scholarships for college, so i am trying to get them in touch with other agencies which could help. And we need to do more for our society! Always more! Glad you guys could get in touch with each other! Thanks Anudivya. I got it. Sorry Arun for using ur comment section. Sonu… Can you pls check my comment at the popsicle post?” Thanks! Great work Arun! You are really devoted social person. Feel glad to hear abt this. You are playing a very important role in others life too…:) Keep it up mate! Here, kids pics are so nice…so innocent and full of hopes. Yes! beautiful kids and very bright! From our first batch of scholarship recipients, two students secured more than 90 percentage in the SSC exams! Yaay! Imagine the potential of so many more poor kids who don’t have access to good schools. This is wonderful Arun, I didn’t know you were involved in all this work. Every child deserves a decent education and healthy food. Thank you Anu! I always felt i was fortunate and endowed with so much. With that comes an immense responsibility to share all that we have received. And I try to squeeze in as much as I can. You can help out in your own little way too! If we all did a little more, I think we can solve this problem. I wish somebody will take care of those beautiful slumdogs in Mumbai. It’s a tragedy there, man!!! Shucks, I feel so bad for them!!! Every time I see my clean plate, I think of them now!! Btw,Trisha got accepted to UNC at Chapel Hill y’day, we are all so happy that she got in where she wanted. Hi Asha – Congrats to Trisha on getting into Chapel Hill; awesome program and close to home too! Yaay! Yes, as I travel the length and breadth of India it is a constant sight; beautiful kids usually undernourished, under clotheed and under everything! I wanted to make a small change and started this scholarship program. There are so many more kid all over; and so much more needs to be done! And amazingly, I never saw a sulking poor kid! They seem to have a beautiful contentment around them. Om ShantiH!